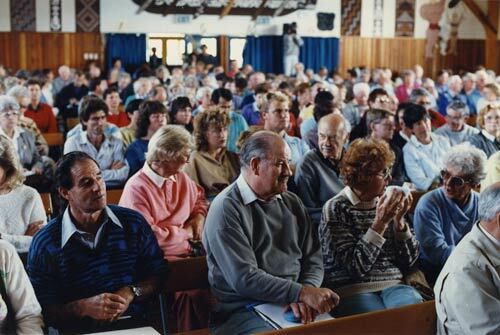 Clients and creditors of the collapsed Upper Hutt law firm Renshaw Edwards meet on 13 April 1992. Patrick Renshaw was jailed for seven years in July 1992 after stealing $6.4 million of clients' money. He was freed in March 1995. His partner Keith Edwards was jailed for six years for stealing $3.5 million, and was freed in August 1994. Strangely, neither partner knew the other was also stealing. By 1997, $29 million had been paid out to victims. The money was raised by a special levy on the country's 2,800 senior lawyers, with each having to pay $10,000. That's a great outcome that most client money was able to be returned. The New Zealand Law Society were certainly hurting after this incident though. $10,000 per solicitor is not to be sneezed at.